• It was showtime at Leveson this week as a string of prime ministers – past and present – the Labour leader, the SNP leader and the chancellor all gave evidence. Gordon Brown, George Osborne, Sir John Major, Ed Miliband and Alex Salmond served up the hors d’œuvre before the biggie, with David Cameron rounding off the stellar week with his day-long grilling at the hands of Leveson and Jay on Thursday. “But seriously I do understand the issue with the Times. Let’s discuss over country supper soon. On the party it was because I had asked a number of NI people to Manchester post-endorsement and they were disappointed not to see you. Eugh! For a round-up of the best reaction to Cam’s appearence read our report here, and for a list of the questions we felt he should have been asked, see here. And we’ve got more on Alex Salmond’s appearance at Leveson here and here and in The Week Outside Westminster below. • Policy wise, the topic of child poverty dominated the agenda, with Iain Duncan Smith coming under attack for the coalition’s failures in this area. Yesterday, the work and pensions secretary bizarrely blamed the deficit on child poverty targets, telling the Today Programme “we got into such a problem over debt and the deficit” by “chasing the target”. Complete nonsense, and a worrying insight into the mindset of one of the government’s top ministers. 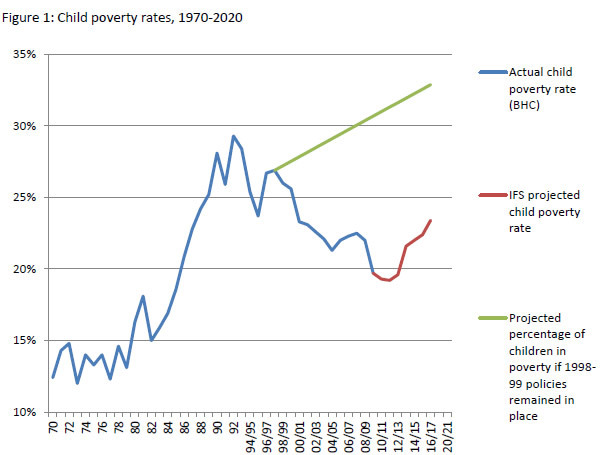 As this graph shows, there was a reduction in child poverty prior to the election – between 900,000 and one million children were lifted out of poverty over the course of the decade – a trend set to be reversed, with the IFS projecting an increase in the child poverty rate. The DWP are continuing to attack the concept of relative poverty, pedalling a number of myths, which we’ve rebutted here, and also this week on Left Foot Forward, read the Resolution Foundation’s Vidhya Alakeson on how the government has “no hope” on reaching its target on reducing child poverty here, and the Child Poverty Action Group’s Lindsay Judge on the story so far here. • In the wake of Leveson, the poor news on the economy and the never-ending omnishambles, the debate on the future of the NHS has taken a back seat – but it won’t stay out of the headlines for long. Next weekend, on Saturday June 23rd, the NHS Support Federation is holding “Reclaiming our NHS”, a public conference for NHS supporters, at Friends House in central London. Among the speakers at the event will be TUC deputy general secretary Frances O’Grady, Polly Toynbee of the Guardian, chair of the Royal College of GPs Dr Clare Gerada and David Babbs of 38 Degrees. On Left Foot Forward on Monday we will have a detailed guide to “the coming NHS crisis”, the main symptoms of which are long trolley waits in A&E; waiting times increasing; saving programmes dominating; nurse staffing levels being cut; and the NHS impact of local authority cuts. This week, meanwhile, polling revealed satisfaction with the NHS has decreased since the Tory-led government came to power, down from 70% to 58%, with dissatisfaction up from 18% to 24%. For more see our report and graphs here. Burmese opposition leader Aung San Suu Kyi, who began a 17-day tour of Europe this week. She is scheduled to visit Switzerland, Britain, Ireland, France and Norway, where she will give an acceptance speech for her Noble Peace Prize, awarded 21 years ago but a laurel she was unable to collect in person as she suffered decades of house arrest at the hands of the junta. Next week, she will address both Houses of Parliament in Westminster Hall – a speech she dare not have dreamt of ever being able to give. David Cameron’s ECR group in the European Parliament, who invited a far-right, anti-Semitic Polish priest to Brussels. Father Tadeusz Rydzyk founded a right-wing radio station that has been condemned by the Vatican and Jewish organisations after broadcasting anti-Semitic views. Given the record of the ECR – branded “a bunch of nutters, anti-Semites, people who deny climate change exists, homophobes” by Nick Clegg – the news will scarcely come as a shock; do not be surprised if there are more such stories in the months ahead. The Robin Hood Tax Coalition’s submission to Labour’s National Policy Forum exhorting the party to adopt a Financial Transactions Tax as official policy. As Treasury select committee member Teresa Pearce MP wrote on Left Foot Forward this week, the FTT – which rolls out the present £3 billion raised through the stamp duty on share transactions to further taxes on bonds and derivatives – has the potential to raise £20 billion per annum in the UK. The NPF meets in Birmingham tomorrow, with pressure increasing on the two Eds to back the FTT. Alex Salmond went to the Leveson Inquiry to accuse the Observer of hacking into his bank account, something denied by the paper’s owners. Turning his attention to accusations of support for Murdoch’s takeover of BSkyB in return for the Scottish Sun’s support of the SNP, the first minister said he supported the bid simply for the economic benefits he felt it would have brought to Scotland. Having been accused by Scottish Lib Dem leader, Willie Rennie, of treating the inquiry as an appearance on the “One Show” sofa, the consensus was that Salmond had put in a strong performance but that questions remained to be answered, as the Daily Record concluded. Elsewhere, the “Yes to Independence” campaign appeared to be in a state of chaos as Green Party leader Patrick Harvie jumped ship, declaring it had become “an entirely SNP vehicle”. The Belfast Telegraph carried results throughout the week of polling it had commissioned on attitudes to Northern Ireland’s political landscape. Alarmingly, the polls showed voters think NI’s system of government is almost as bad as the recent disastrous Greek administration; fewer than one in 10 voters think the Assembly has performed better than direct rule, whilst 41% rate its performance as poor or very poor. Overall, Stormont has a net favourability rating of -40%. Environment minister Alex Attwood told the Assembly the results “do not make pleasant reading”. The poll, carried out by Lucid Talk, revealed just 7% of people in Northern Ireland would support a United Ireland if there was a poll this year. “Both [parties] have played the border card often in the past. Sinn Fein continually argues that Irish unity is not only achievable but approaching. The DUP has never been slow to warn its supporters that they could be voted into a united Ireland at any moment unless they keep their guard up and make every vote count. 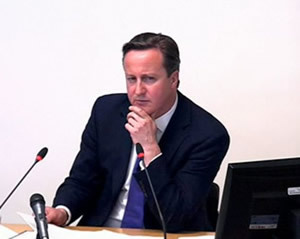 Plaid Cymru’s Westminster leader, Elfyn Llwyd, used Prime Minister’s Questions to press David Cameron over the money spent on coaching ministers ahead of their appearances before the Leveson Inquiry. On Wednesday, a special election in Arizona’s 8th congressional district saw the Democrats retain Gabrielle Giffords’s old House seat. Giffords, who almost died last year after being shot in the head by a lone gunman while meeting constituents in Tuscon, resigned her seat in January. The contest saw Ron Barber, formerly one of Giffords’s aides, defeat Jesse Kelly, a former marine who had previously run against Giffords in 2010. Woeful imagery and soundbites such as David Axelrod’s Massachusetts Senate House speech and Obama’s observation that “the private sector is doing fine” aside, economic affairs continue to do the most damage, with last week’s awful unemployment and job creation statistics undermining Obama’s message of economic recovery. Mitt Romney, meanwhile, continues to do well in the fundraising stakes. As we mentioned last week, the Republicans have already decisively outstripped the Democrats in terms of financial clout for the coming months. Now, Sheldon Adelson, a Las Vegas casino magnate who formerly bankrolled Newt Gingrich’s assault on the Republican primaries almost by himself, has just donated $10m to the Romney campaign. The donation went to “Restore Our Future”, Romney’s super PAC (a type of fundraising committee that exploits a legal loophole in order to raise unlimited funds from individuals, corporations and unions). Restore Our Future has thus far raised $50 million for Romney. Adelson’s donation, notes the Huffington Post, “marks the next stage for the super PAC, as it pivots to target President Barack Obama”. In Egypt, the constitutional court has come close to nullifying the results of last month’s parliamentary elections. It declared a third of the seats as ‘void’ on the basis they had been contested by political parties rather than the independents for whom they were technically reserved. As Sky News say, the move “could trigger the dissolution of the whole Parliament – or, at the very least, a re-election for a third of the seats”, as a result of which the Muslim Brotherhood and Salafist parties that currently dominate the legislature could lose out. At the same time, the court ruled Ahmed Shafiq, formerly prime minister during the Mubarak era, is eligible to stand in the presidential run-off election against Mohammed Morsi of the Muslim Brotherhood. Obligatory Twitter lols aside, the court’s decisions have renewed fears both of a military coup and a return to the ancien regime. Meanwhile, across the Mediterranean, Greece will go to the polls again on Sunday, with the stakes arguably as high as in Egypt. Official polling is banned in Greece for the two weeks prior to an election and so, beyond the supposition it’s a two-horse race between the pro-bailout conservative New Democracy party and the socialist SYRIZA bloc, everyone is in the dark. However, over at the New Statesman, Alex Hern flags up one possible clue to the outcome: a surge in the Greek stock market on Thursday which, unconfirmed reports suggest, is due to ‘secret polls’ that show New Democracy in the lead. And finally this week, to Spain, where bond yields – the costs of servicing government debt – have hit 7 per cent after last week’s downgrade of the country’s credit rating. The level is the same as that which has already seen Portugal, Ireland and Greece turn to the EU, European Central Bank and IMF for bailouts, the price of borrowing from the markets having become too high, with Sky describing it as a “psychologically significant threshold”. I suppose you mean the English NHS given that health is a devolved matter and in Scotland is the responsibility of the SNP government and in Wales the Labour PC coalition? So why don’t you say so? Labour are in coalition with Plaid in Wales? Somebody better tell them… Seeing that you want home rule for England, you should probably brush up on what’s going on in the other home nations first! Also, considering that the Wales section of “The Week Outside Westminster” mostly consisted of Elfyn Llwyd in Westminster, I feel a little bit short-changed. And you spelt his name wrong the second time.